Speaking of history, yesterday I hung out with Arlette and we had fun perusing one of my favorite coffeetable books, Nineteenth Century Fashion in Detail. I also recently ordered Historical Fashion in Detail: The 17th and 18th Centuries, and Dress in Detail from Around the World, also published by the Victoria and Albert Museum. The photographs alone make these books a phenomenal source of inspiration -- you can really see the details of construction which went into making these garments. I am not particularly skilled at sewing, but I do find that looking through this book gives me lots of ideas for improving the fit and styling of knitting designs, as well as a sense of how much care in small details really makes a difference. I don't know when I'll get around to it, but I've had some preliminary sketches knocking about for a while of a knitted sweater inspired by this dress. I love the combination of the blue and the soft gold, and I think the squared neckline and set-in sleeves would flatter most figures. Even if I never actually knit my own version, I enjoy thinking through the design process -- what type of yarn would have the best drape and sheen? what gauge would work best? what's the best way to incorporate a solid-color panel into the front of the garment? There is no single "right" answer to any of those questions, but arguing with myself is a heck of a lot of fun. Those books look amazing. 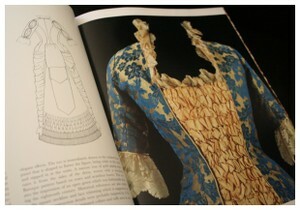 I adore looking at fashion/costume books. I don't really sew, but they are inspiring. I can see the sweater in that dress. Lovely drapey bell sleeves, maybe even a longer ribbed collar that would stand slightly. Would love to see the pattern you come up with. I agree! Those books are inspiring from both a design and historical perspective. So was a visit to the V & A Museum to see some of those stunning garments in person. Flip through the Walker Treasuries to see if there is a puckered or gathered stitch that gives the feeling of that center panel. I'd love to see your modern design interpretation! The V&A books are terrific. I have all the titles you mention, plus "Modern Fashion in Detail". Another killer is "Fashion", subtitled "The Collection of the Kyoto Costume Institute A History from the 18th to the 20th Century" (much too long a title), published by Taschen. All are unbelievably stimulating. I wouldn't be without any of 'em. I love the knitted Caesar doll idea. My husband is a classicist, I will have to make one for him. I will devise a pattern and share!